The Web has enabled unprecedented levels of communication and sharing, expanding access to information around the globe, while also raising broad concerns about the future of individual privacy. This talk will explore some of the current technology and policy problems under debate – from Do Not Track to the right to be forgotten. Will DeVries is Policy Counsel for Google, focusing on privacy and consumer protection. In that role, Will works on regulatory and legislative issues ranging from social networking to online advertising to government access to records. He also teaches E-Commerce Law and Information Privacy Law at the George Washington University Law School, and speaks regularly on related topics. Prior to Google, Will worked in the Communications, Privacy and Information Law group at WilmerHale LLP. Will is a graduate of Princeton University and the University of California, Berkeley School of Law. 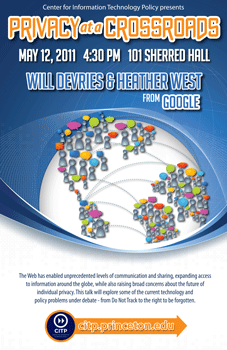 Heather West is a Policy Analyst for Google, focussing on privacy, free expression, and transparency. In that role, Heather works on regulatory and legislative issues from social networking to online advertising to government data. Prior to Google, Heather worked at the Center for Democracy and Technology.